It’s only when they arrive that the youngster realises where their new home is – on Flower Island, the site of the city’s main waste landfill. As the boy struggles to come to terms with the smell, the filth and the flies, he’s soon missing his old haunts back in the city. He’s even less content when he sees his new home, a shack knocked up by the Baron, his mother’s new foreman (and very soon her lover too). However, he gradually adjusts to his new home, mainly with the help of the Baron’s son, Baldspot, a simple boy with the run of the island. Together, the boys explore the areas outside the tip, and as they venture further afield, Bugeye discovers that there’s a lot more to life on the island than meets the eye, particularly if you can keep an open mind as to what might be down by the river. 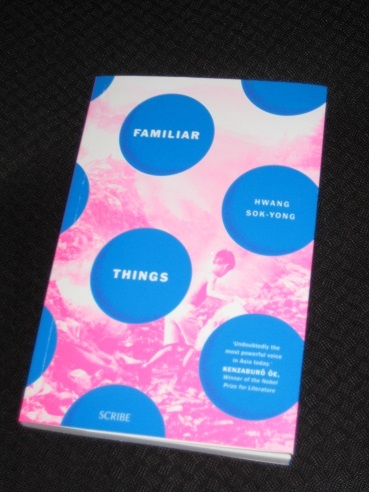 Familiar Things is a fairly short novel, and a relatively easy read, but it’s also highly entertaining and thought-provoking. It takes place in the late seventies, with the scene set for the local audience by mentions of the General taking power (and for me by mentions of Star Wars…) and is another work in the tradition of books critiquing Korea’s rapid industrialisation. Hwang is an expert at peeling back the skin on the wounds of Korea’s recent past, and here he turns his attention to the end stages of consumerism. Seoul is now a booming metropolis – but where does all the rubbish go? Flower Island is a pretty name for a filthy place, and Hwang takes us there and explains how it all works. What we are shown is a parallel society where workers root through the rubbish to find salvageable and saleable goods. Like any society, there are strict rules here, with the rubbish from different districts being disposed of in separate areas. The workers hoping to find treasure amongst the trash are forced to buy permits (the better the loot, the more they have to pay), but they are merely the bottom rung of a whole industry with thousands of people living (literally) off the scraps. When the workers go out to let off steam after a hard week at the tip, they find themselves shunned by the normal folk (because of the ever-present smell…), needing to bathe extensively and keep clothes handy somewhere off the island if they want to be allowed in anywhere. A more worrying issue, though, is the danger of life on the island. There’s always the chance of a drunken brawl, of course, but with so much rubbish around, it’s the risk of an accident which usually plays on the workers’ minds. Ever heard of dokkaebi? The word will no doubt be familiar to fans of Korean dramas, and here we get to meet these Korean spirits. In a similar vein to his flights of fancy in The Guest and Princess Bari, Hwang manages to have the modern world coexist with its shadow side as the boys get to see how life used to be on Flower Island before the rubbish trucks rolled in. This ghostly sub-plot nicely complements the more mundane day-to-day trials and tribulations and never becomes overpowering or ludicrous. Great review, Tony. I read this book a weekend or so ago but haven’t had time to blog about it. I was worried the ghost element would overshadow the real story here (that industrialisation and consumerism comes at a cost and that a rising tide doesn’t lift all boats) but as you point out it’s never ludicrous. It’s actually a nice device for showing us (and the boys) that the island wasn’t always such a hellhole.